(小萩無官太夫) at the Gojō Bridge. Waseda University identifies this play as Suma no Miyako Gempei Tsutsuji (須磨都源平躑躅). In that play the young and handsome Taira Atsumori, dressed as a woman named Kohagi, meets Kumagai Jirō Naozane at the foot of Gojō Bridge. Atsumori has taken on this disguise to escape his enemies. He has taken refuge in the shop/home of a former retainer Kazusa who now makes fans in the Gojō district of Kyoto. The fan-maker's daughter Katsurako falls in love with the youth. Before he is discovered Samuel L. Leiter notes of the scene between Katsurako and Kogahi (aka Atsumori) that "There are no other lesbian-like love scenes in kabuki like the one between [these two]." The death of the young Taira warrior Atsumori at the hands of Kumagai Jiro Naozane at the battle of Ichinotani has already been described... Encounters between the two became elements of many Kabuki plays, including 'Suma no Miyako Gempei tsutsuji' (also known as 'Ogiya Kumagai') in which the plot was transferred to Kyoto. In 1832 the scene depicted on this large theatre signboard, the encounter at Gojo Bridge, was added to be performed by the great Nakamura Utaemon III and has been an integral part of the play ever since. 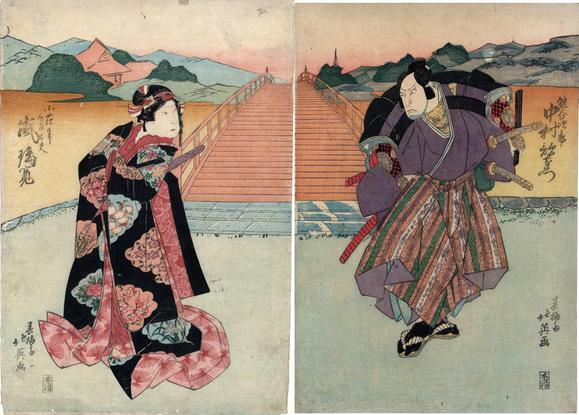 The fight between the handsome young Atsumori and Kumagai, with his fierce red makeup, was a reworking of the encounter between Ushiwaka-maru (the young Minamoto no Yoshitsune) and the warrior-monk Benkei at the same spot, a story well known to all. There is another copy of this diptych in the Los Angeles County Museum of Art, but it is not illustrated online. There is another print in the Lyon Collection of Atsumori dressed as Kohagi. It is by Hokkei and dates from 1818. Click on the link above to see it.